01: PhotoBlocker Spray : Buy 1 50% OFF! Comes with Free PhantomALERT.com app for your GPS or smartphone. 100% LEGAL! 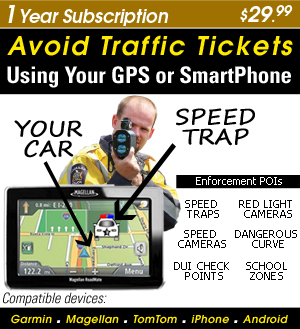 Free eBook to help you fight traffic tickets. This purchase includes your FREE e-Book: "FIGHT BACK: How To Fight Red-Light and Speed Camera Tickets" . Spray it and make your license plate invisible to cameras. NOTE : Check your local DMV laws before buying. 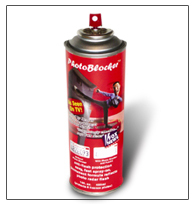 03: PhotoBlocker Spray : Buy 3 Get 2 More Cans FREE + FREE Shipping 50-70% OFF! This purchase includes your FREE e-Book: "FIGHT BACK: How To Fight Red-Light and Speed Camera Tickets"
NEW AND IMPROVED, PATENT-PENDING! Reflects photo radar flash. Spray it and make your license plate invisible to cameras. Proven to beat cameras. NOTE : Check your local DMV laws before buying. Our PhotoShield is a high quality clear cover. Incorporating a thin diffusion lens, designed to defeat cameras! Our design is effective, inconspicuous and defeats most cameras! NOTE : Check your local DMV laws before buying. Our PhotoShield is a high quality clear cover. Incorporating a thin diffusion lens, designed to defeat cameras! Our design is effective, inconspicuous and defeats msot cameras! NOTE : Check your local DMV laws before buying. NEW AND IMPROVED! Reflects photo radar flash. Spray it and make your license plate invisible to most cameras. Proven to beat photo radar and red light cameras. NOTE : Check your local DMV laws before buying. 08: PhotoShield Cover for Motorcycles (US/CANADA) 50% OFF! PhotoShield for motorcycles is designed to defeat Most e camera angles. It protects you against cameras mounted high over-head, on poles, bridges, overpasses, vans and side angles as well. So stealthy, most drivers won't even know you have it on. Get one before you get a $300 ticket in the mail. NOTE : Check your local DMV laws before buying. The Reflector helps to prevent costly tickets. Made of high quality plastic cover with light reflecting crystals, The Reflector overexposes photo radar and red light camera pictures by reflecting flash back to camera. NOTE : Check your local DMV laws before buying. high quality plastic cover with light reflecting crystals, The Reflector overexposes photos by reflecting flash back to camera. NOTE : Check your local DMV laws before buying. The Reflector helps to prevent costly tickets. NOTE : Check your local DMV laws before buying. Avoid traffic tickets. 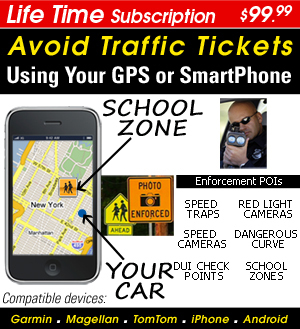 Turn your Smart phone or GPS in to a speed trap & red light/speed camera detector. Download PhantomALERT’s app containing over 400,000 + enforcement locations for the whole US & Canada. PhantomALERT gives you audible and visual warnings as you drive, alerting you to approaching traffic enforcement zones in plenty of time to adjust to changing traffic conditions. It does the work for you - NO MORE SURPRISES. . Compatible with Garmin, TomTom, Magellan GPS and iPhone, Android and BlackBerry Smart Phones. Avoid traffic tickets 100% LEGAL way. 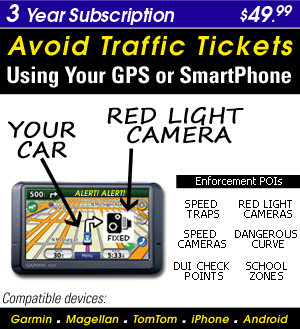 Turn your Smart phone or GPS in to a speed trap & red light/speed camera detector. Download PhantomALERT’s app containing over 400,000 + enforcement locations for the whole US & Canada. PhantomALERT gives you audible and visual warnings as you drive, alerting you to approaching traffic enforcement zones in plenty of time to adjust to changing traffic conditions. It does the work for you - NO MORE SURPRISES. . Compatible with Garmin, TomTom, Magellan GPS and iPhone, Android and BlackBerry Smart Phones.